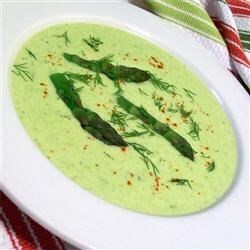 Had some extra asparagus so I decided to try this soup and it turned out GREAT! I used a whole stick of butter because I was too lazy to measure out 6 tablespoons. I cooked it on my gas stove over low heat so the onions wouldn't burn. I also mixed it with a hand blender rather than puree in a regular blender. I love using my Braun hand blender. Everyone liked it and it had great flavor. I left out the soy sauce and used a little extra white pepper. The tips were like little bonuses in the soup. Highly recommend it!